A whole pork belly benefits from being cooked low and slow, which makes it a prime candidate for indirect cooking on the barbecue, resulting in a delicious smoky flavour and soft, tender meat that literally falls apart. When buying pork belly, think about how many you wish to feed. A whole, large pork belly will feed around ten people, but the pieces available in the supermarkets are generally smaller – a 500g belly piece will feed up to four people. Pork belly strips and slices are also widely available in supermarkets and are better for quick cooking. The pork will benefit from being marinated before cooking, preferably overnight to give the flavours a chance to really seep into the meat. A dry rub made from a mixture of herbs, spices and salt will help. Luke Holder takes the stress out of barbecuing pork belly by cooking it sous vide at a controlled low temperature, before finishing on the barbecue for a crisp, smoky exterior. Adam Gray marinates his pork belly in beer before cooking in the oven and finishing on the barbecue. 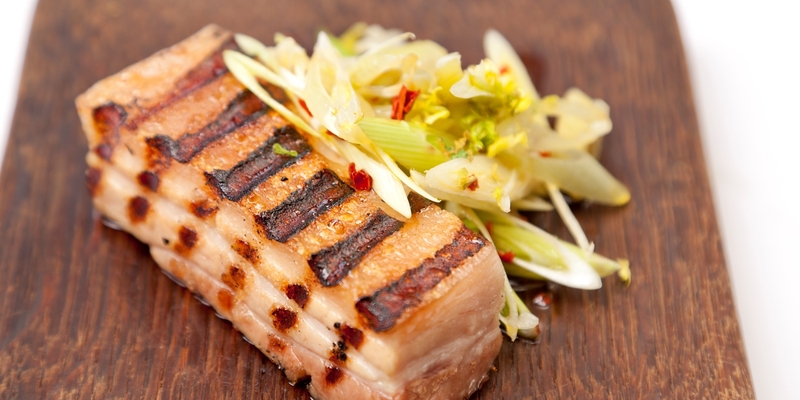 Try serving your perfectly barbecued pork belly with a fresh, vibrant summer salad. Experiment with unusual combinations such as James Ramsden’s Roasted radishes, whipped feta, brown butter leeks and poppy seeds or why not have a go at Dominic Chapman’ s Warm Jersey Royals salad with spring onions and aioli.